In 1910 Polasek was awarded America’s top art scholarship, The Prix de Rome, granting him a three-year fellowship to study at the American Academy of Art in Rome, Italy. The secretary of the Academy, Francis Millet, was an erudite gentleman, familiar with twelve languages and highly celebrated for his brilliant personality. In April 1912, shortly after sitting for the portrait bust, Millet sailed for the United States on the ocean liner Titanic and perished. 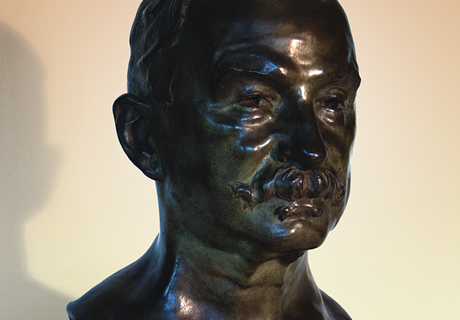 Ten bronzes were cast of Polasek’s portrait of Millet and were placed at locations including the Pennsylvania Academy of the Fine Arts, Harvard University, The American Academy in Rome and New York University.